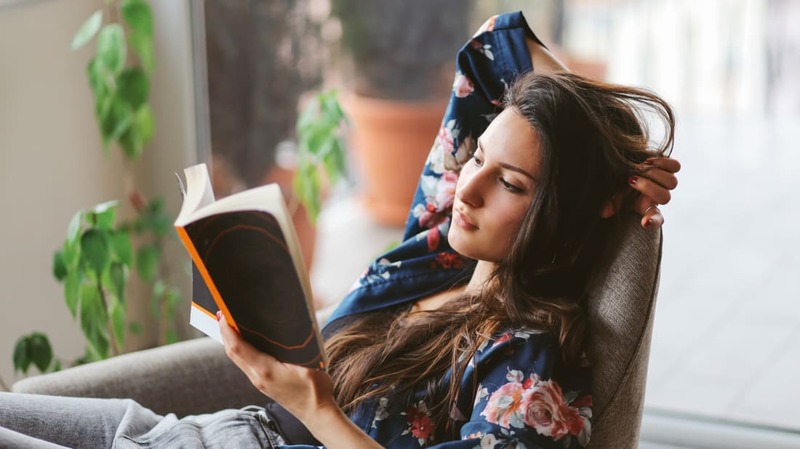 Readers of print books absorb and remember more of the plot than readers of e-books do, according to a study that was presented in Italy in 2014. In an earlier study, print readers also scored higher in other areas, such as empathy, immersion in the book, and understanding of the narrative. Scientists believe this effect is related to the tactile sensation of holding a book in your hands. In other words, seeing and feeling how much progress you’ve made in the story, by virtue of the waxing and waning pages on either side of the book, can help readers feel like they’re unfolding the story—both literally and figuratively. Plus, with a print book, it’s easier to go back and confirm information you may be unsure of without losing your place and having to scroll or click back on your mobile device or tablet. 2. THEY HELP CHILDREN BECOME BETTER READERS, TOO. Another study of young children between the ages of three and five revealed that kids had lower comprehension of the story when their parents read to them from an e-book as opposed to a print book. Researchers theorize this arises because children get distracted by the electronic device and have a harder time focusing on the story itself. In another study, students who had read a short story on a e-reader were less engaged and had a harder time remembering the exact order of events. Considering that many jobs require you to stare at a computer screen all day, it’s wise to give your eyes a break whenever you can. One survey of 429 university students revealed that nearly half had complained of strained eyes after reading digitally. Electronic books can cause screen fatigue, which may lead to blurred vision, redness, dryness, and irritation. With print books, you don’t have to worry about any of that. 4. YOU’RE LESS LIKELY TO GET DISTRACTED. Perhaps unsurprisingly, people who read e-books tend to get sidetracked more easily, but not just because the internet is right at their fingertips. Digital readers tend to spend more time scanning for keywords than actually processing what they’re reading. And with a print book, there’s no chance of getting distracted by links or getting sucked down an internet rabbit hole of looking up the collective term for a group of ferrets (they’re called a “business,” by the way). According to one survey, 67 percent of university students were able to multitask while reading digitally, compared to 41 percent of print readers. But if your goal is to fully grasp and comprehend the text in front of you, that isn’t necessarily a good thing. When you’re winding down for the night, reading from a screen or scrolling through a social media app on your phone are bad ideas. Study after study has shown that the blue light from your screen can toy with your melatonin levels and circadian cycles, making it harder for you to fall asleep and making you feel groggier when you wake up. In general, though, the engagement and brain activity that come with reading can help you drift off to sleep when you’re having trouble. So if you’re hoping to get a good night’s rest, stick with print. 6. HAVING A LIBRARY AT HOME IS LINKED TO HIGHER ACADEMIC ACHIEVEMENT. Students who have books at home are more likely to score higher on tests, according to a study of readers from 42 countries. It doesn’t matter how many books you have, but each additional book helps children perform better in school. This is especially true for children from disadvantaged families. Researchers believe this is because having books at home encourages children to read for fun and talk to their parents about what they’ve learned, which only stands to benefit them in the classroom. One recent study of college students in the U.S., Slovakia, Japan, and Germany showed that 92 percent of participants preferred actual books that they can hold and touch and leaf through whenever they please. Students cited fewer distractions and less eye strain as a couple of the reasons why they prefer printed materials, but other explanations were related to how books make them feel. Reading on paper books can enrich the entire experience, but it’s not the only amazing feat that paper can pull off. Learn more at howlifeunfolds.com/learn. Sources: The New York Times, PHLabs, The New Republic, GQ, Mic, Good, Wonderopolis, PS Mag, LA Times, Mental Floss, Huffington Post.